There are 2 types of Thomas splint frame. Come in 2 sizes (Child and Adult) and 2 types (adhesive and non-adhesive). Generally adhesive is used for children, and non-adhesive for older children and adults. Ensure adequate analgesia has been established. 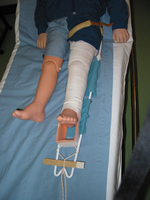 Select a left or right sided splint, of the correct size. Choose the size closest to your measurements, but round-up. The frame sizings are usually written on the rings at the top. 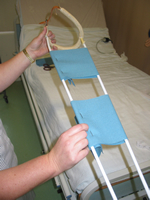 Apply calico slings to the selected frame by looping them around the steel rods. Secure them with safety pins. Put the safety pins on the lateral side, and at the back, so they are out of the way. Apply firm manual traction to the limb maintaining the foot in a dorsiflexed position. Apply the skin extension longitudinally around the leg. It should extend to the upper part of the thigh along both sides. The spongy part should be located symmetrically under the sole of the foot, with a gap of 4 cm between it and the foot ( to allow for plantar flexion ). The foam should extend to cover each malleolus for protection. The skin traction should then be secured from thigh to the ankle using crepe bandages. It is a good idea to leave the knee and fibula head free from the bandage to reduce the risk of peroneal nerve compression at the fibular head. 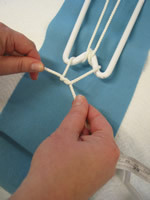 The traction cords are now pulled tight around the W shape at the bottom of the splint and secured firmly. 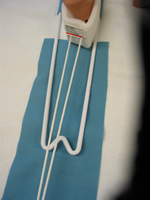 The taped tongue depressor are inserted between the cords and twisted round several times ( ie used as a Windlass ). This creates the traction. One suggested way of doing all this is shown below in the diagrams below. Content by Dr Ian Higginson; Steve Ball, Dr Íomhar O' Sullivan 05/06/2005, 10/02/2007. Last review Dr ÍOS 3/09/14.